The Perry High School Giving Garden is a joint effort between the Perry Service Learning (PSL) program, Library Council, Recycling Club, Family & Consumer Science Department, and Industrial Arts Department. The garden began in 2012 with the purpose of providing fresh produce to The Perry Center (our local food bank), teaching Perry students about sustainable growing techniques, and providing hands on service learning opportunities for students in grades K-12. 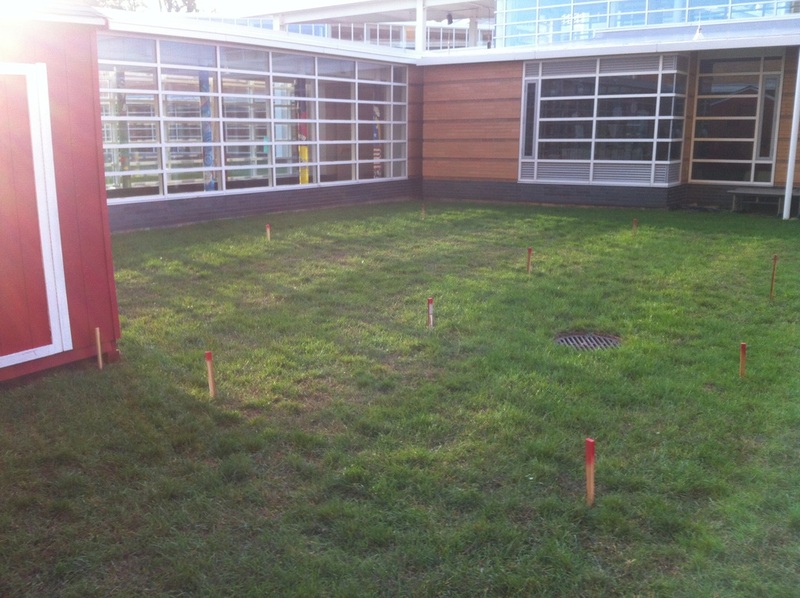 During its inaugural year, the PHS Giving Garden's four vegetable beds (900 sq. ft.) produced over 850 lbs. of produce - all of which went directly to the Perry Center to feed local families in need. The Perry Center serves nearly 3,000 people annually, 40% of whom are children under the age of 17. In 2013, the PHS Giving Garden added two additional vegetable beds bringing the total size of the garden to 1,350 square feet in hopes of providing over 1,000 pounds of produce to the Perry Center. Future plans include a wheelchair accessible pathway and raised beds, an outdoor classroom, and additional beds dedicated to educating students about plants that are native to Northeast Ohio. 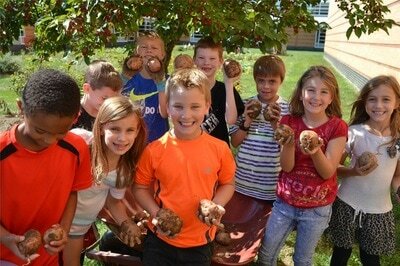 Classrooms and programs within the Perry Local Schools are welcome to adopt a bed in the PHS Giving Garden or contribute in others ways. Please contact us if you have questions or suggestions about how your classroom or group can partner with us. We are currently using approximately 45% of the PHS courtyard and there is plenty of room to expand! 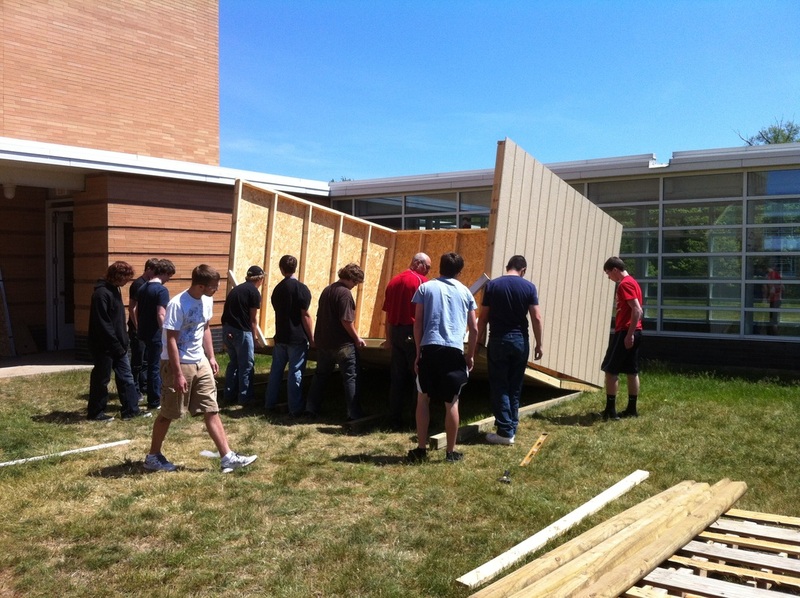 Mr. Ryan's students construct the shed. In addition to the six vegetable beds, the PHS Giving Garden consists of two 15' x 15' perennial beds. Garden volunteers create beautiful arrangements using cutting flowers from these beds and sell them for reasonable prices between June and September. All proceeds are invested back into the garden. If you are interested in purchasing a cut flower arrangement from the PHS Giving Garden please contact us today. Requests are subject to availability. 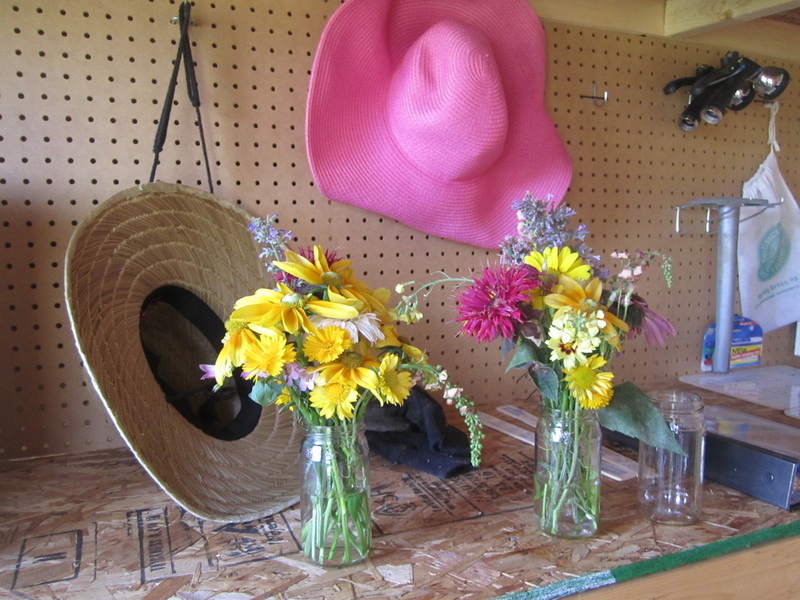 Photo (left): Two flower arrangements from the PHS Giving Garden. 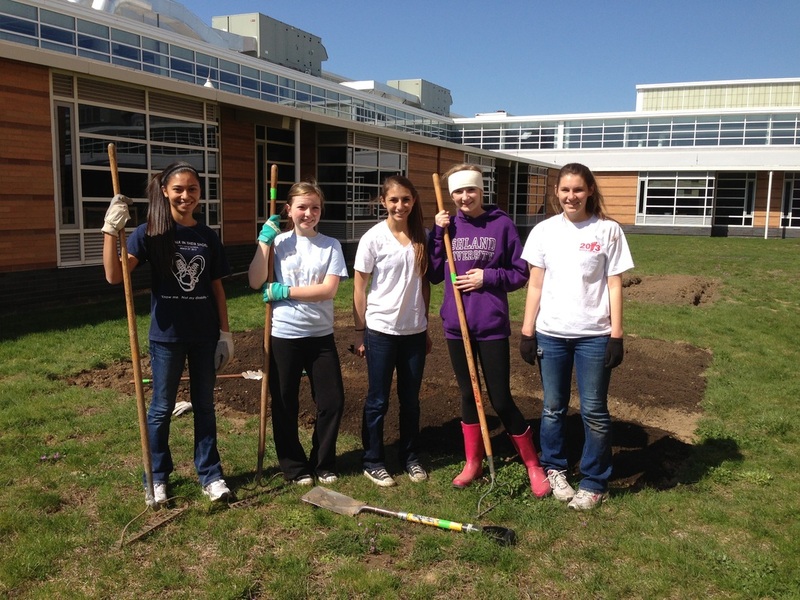 The PHS Giving Garden depends on volunteers to prepare garden beds, plant, water, weed, and harvest. Our annual garden big dig event takes place during Community Green Day on the 4th Saturday in April. 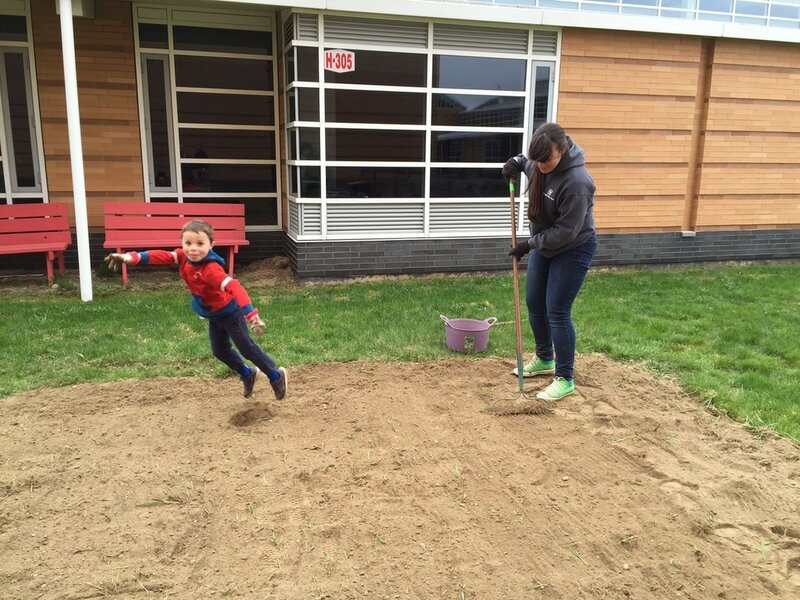 During the school year, volunteers typically work in the garden on Tuesdays and Thursdays. Over the summer, volunteers are needed on Tuesdays and Fridays. In the off season, volunteers are needed to assist with garden maintenance and small construction projects. Volunteering in the garden is a great way to earn community service hours while helping members of your community. No previous gardening experience is necessary. If you are interested in becoming a PHS Giving Garden volunteer, please contact us. ​The Giving Garden is always looking for donations of tools and garden equipment. Specific needs include: roto-tiller, 6 ft. ladder, heavy duty door mats, and a 100 ft. hose. Please consider making a donation today to help us continue to serve the students and people of Perry. In May 2011, a group of students and teachers traveled to the Seeds of Hope Farm in Tiffin, Ohio to learn about the day-to-day operation of the farm and determine if a garden would be feasible for Perry High School. Inspired by what they saw, this group returned to Perry and began the process of finding a suitable location on campus, recruiting interested students, and securing grant money to make the project a reality. 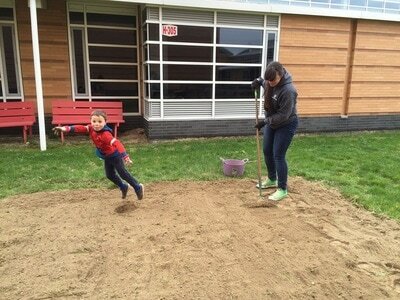 Mikala Blakesmith, class of 2012, was the first student leader of the PHS Giving Garden. Through her efforts, the PHS Giving Garden secured a $5,000 Toolbox for Education Grant from Lowe's as well as donations from local businesses and farmers. 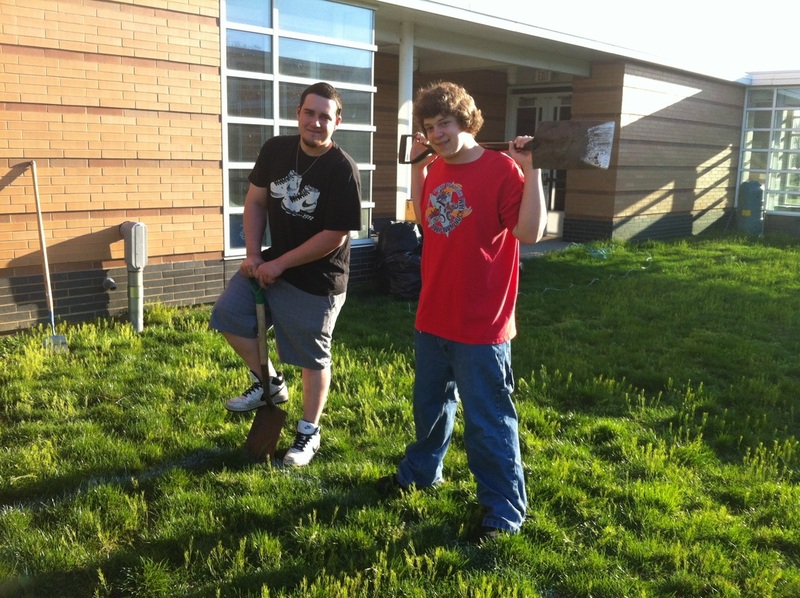 Jay Karadin and Ryan Bevins begin digging the garden in March 2012. 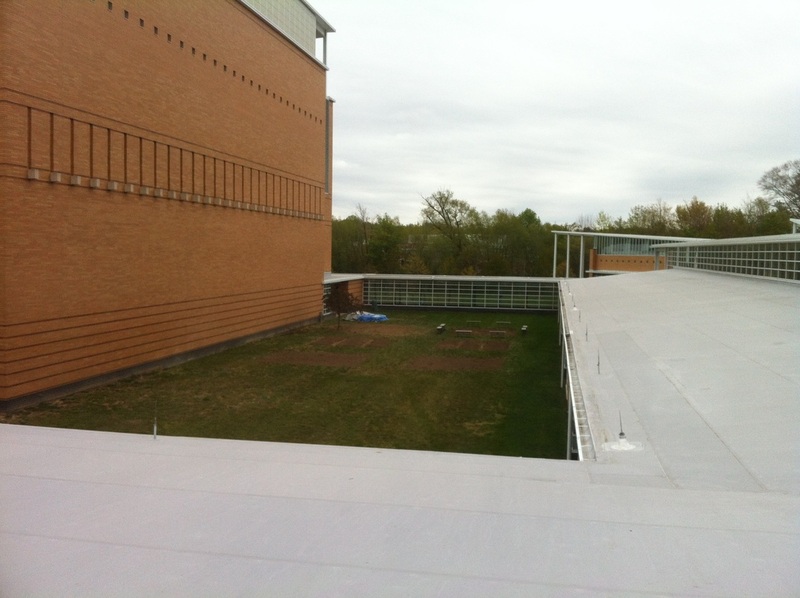 The PHS courtyard as it appeared following Community Green Day in April 2012. 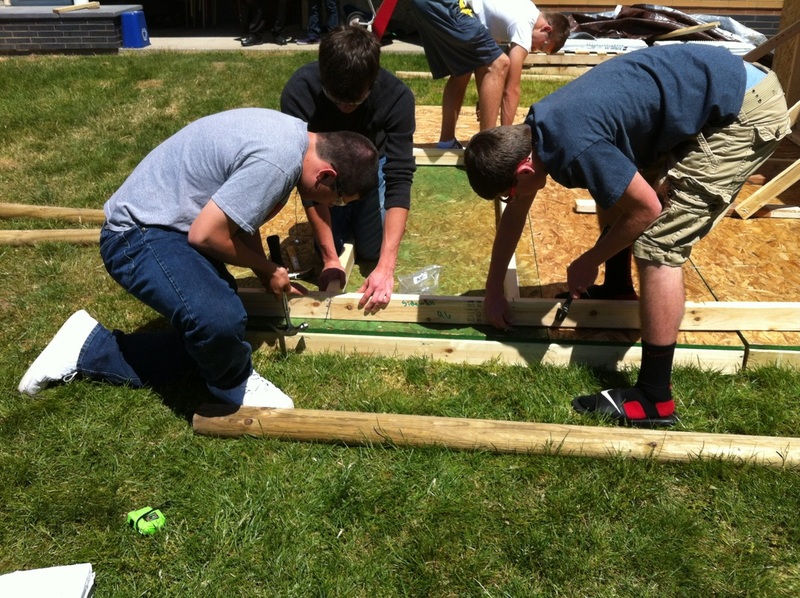 Students in Mr. Ryan's class building the shed in May 2012. 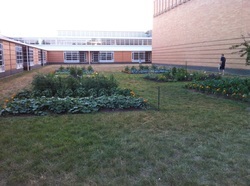 The PHS Giving Garden in July 2012. Proposed location of wheelchair accessible raised beds and pathway. Matt Sutch, Jay Karadin, Ryan Bevins, Anthony Miller, and Ken Voegtler were instrumental in getting four 15' x'15 vegetable beds and two '15 x '15 perennial beds ready in time for our first season. The Perry Service Learning Program was responsible for maintaining 4 vegetable beds during the first season, while Library Council cared for the perennial beds, and Mrs. Greig adopted a vegetable bed to provide produces for students in her Family & Consumer Science classes. 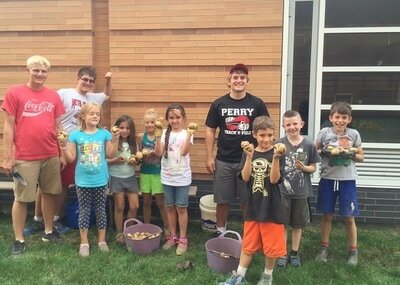 In all, a total of 850 pounds of produce was harvested and donated to the Perry Center (our local food pantry) during the PHS Giving Garden's first season. 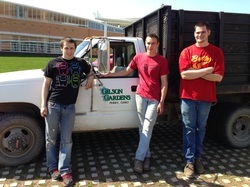 August 2012 brought a new crop of PHS seniors to lead the way for the garden. Nick Hashier and Sean Tooley built a potting bench using wood from recycled pallets. They also build a 3 bin compost system with lumber donated by the PHS Recycling Club. Katie Lauria and Katelyn Marsey started a "Grounds for Good" campaign and began collecting coffee grounds throughout the district to add to our new compost bin. In April 2013, a sixth vegetable bed was added and maintained by the PSL program. Not only did this addition help increase the amount of produce shared with the Perry Center, but it also allowed more opportunities for Perry Elementary School students to help with our fall 2013 harvest. As part of the events at our 2013 Shantytown, students added another bed to the garden which will be used to help celebrate the many veterans in our community. The Veterans' Garden features boxwood shrubs donated by Cottage Gardens, as well as memorial markers donated by a Perry community member. In spring 2017, the Veterans' Garden will be refreshed with butterfly-friendly plants as part of a Girl Scout project.